Here are the top Saigon tours, which range from full-day trips to the iconic Chu Chi Tunnels to boat cruises through the vast Mekong Delta.Half-Day Cu Chi Tunnels Tour. 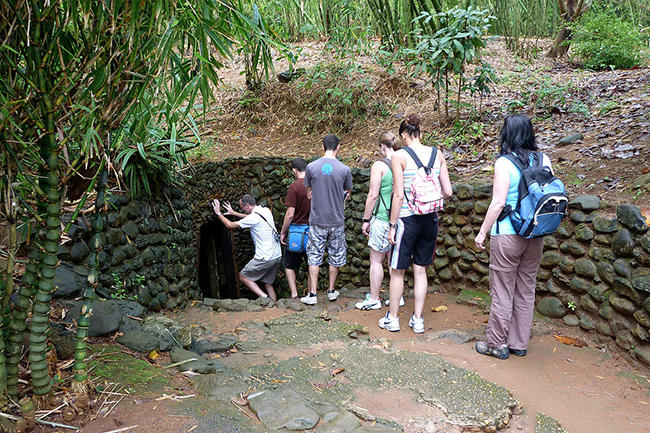 Explore the underground passageways used by Vietnam liberation soldiers during the Vietnam War as you head to the Cu Chi tunnels with an experienced guide. Learn how the extensive subterranean world was created, watch engaging documentaries about its use, and get the chance to fire an AK-47 assault rifle.Start your day with the convenient pickup from your hotel, cruising out of town past water-filled rice paddies and farm-flecked landscapes to reach the entrance to the Cu Chi tunnels. When you arrive, climb down into tight passageways that weave between rooms once used as command centers, bunkers, kitchens, hospitals, and living quarters for Vietnam liberation soldiers.Listen as your guide shares stories about how the tunnels offered protection from explosions and detection, watch an intriguing video about the Vietnam War, and then head back outside to a nearby gun range. Test your accuracy with the chance to shoot a powerful AK-47, find out why this powerful weapon was so popular, and then return to your waiting shuttle for the quick trip back to HCM City and your hotel. 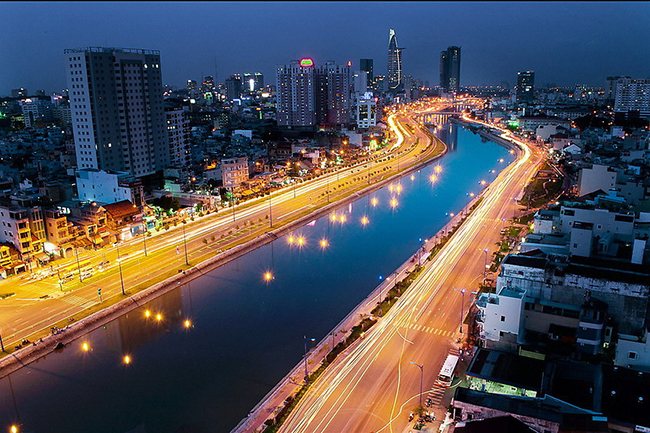 Spend the day discovering the history, traditions, and culture of the energetic Ho Chi Minh City. Follow your local guide as you wander through timeless winding alleys to magnificent pagodas, bustling marketplaces, gourmet restaurants, and architectural wonders.Begin your day with a convenient hotel pickup that transports you to your first destination, Ben Thanh Market. Here, experience the daily life of many city dwellers as you wander through the vendor-lined market walkways. See the colorful arrangements of handcrafted art and textiles, smell the aroma of freshly cooked snacks, and listen to the chanting voices of street vendors. Next, make your way to the War Remnants Museum, where you can appreciate the wide collection of images dedicated to deceased American and Vietnamese photographers and journalists from the wars of resistance against the French and American.Afterward, step back in time to the war period to witness the Reunification Palace, as well as outstanding examples of French colonial architecture at Notre Dame Cathedral and the Central Post Office before being comfortably transported back to your hotel. Cruise past quaint riverfront villages and stilted houses as you drive into the Mekong Delta with an experienced local guide. Nibble on sweet-tooth-satisfying coconut candies, watch a traditional folk music performance and tuck into a delicious lunch of Vietnamese specialties on this active excursion.Ride out of Ho Chi Minh City after getting picked up at your hotel. From your window seat, look for water buffaloes wading through verdant rice paddies and get a close look at Vietnam's rural side. Continue on to My Tho, where you can hop on a small riverboat bound for the tributaries of the Mekong River. Drift past elevated houses and quiet rural scenes before reaching the island village of Ben Tre.Under the cover of swaying coconut trees, meander around this tiny outpost for the remainder of the afternoon, visiting coconut candy makers, tasting the honey tea and wine, and watching folk musicians play a few tunes.Recharge with a tasty lunch served outside, and then take some free time to explore the village on your own before cruising back to your shuttle and catching a lift to Ho Chi Minh City. 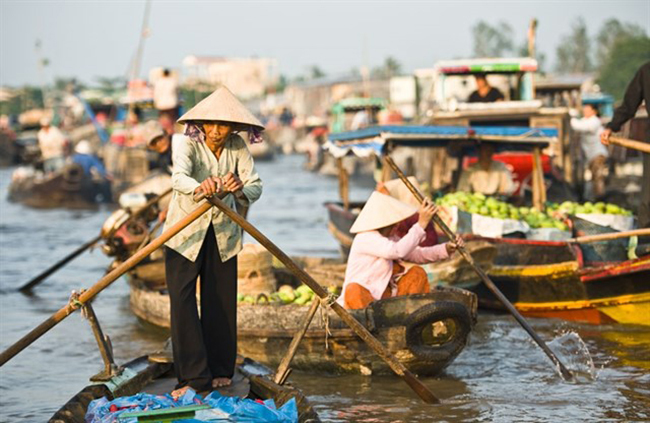 See the largest city in Vietnam with a look at its different neighborhoods on a delectable breakfast cruise. This tour shows you the beautiful green areas, new urban areas, and the impressive skyline of Ho Chi Minh City, all while you dine on some favorite dishes from Vietnam and the West.Your vessel, a luxurious Vietnamese-built boat, features a bar and covered deck so you can enjoy the view of the city from the shade. While you're on board, you can dine on a breakfast with baguettes, salads, fresh orange juice, coffee, and tea. The journey takes you out onto the Saigon River and around the beautiful Thanh Da Island, a peaceful rural area in the heart of the city where time permitting, you can buy fresh coconuts before moving on toward the city center. Pass under Saigon Bridge and by the construction site for Landmark 81, which will be Vietnam's tallest skyscraper, before you see Ba Son, a military wharf constructed by the French in the colonial days.Next, you reach the city center, where you can admire the skyline and many of the city's historic buildings. The tour ends at the famous Mong Bridge opposite the State Bank and the Stock Exchange. Zip through the tight alleys and charming lanes around Cholon, Ho Chi Minh City's massive Chinatown district. On your 3-wheeled ride, enjoy cruising past lantern-lined shops and elegant pagodas as you scope out the sights in this colorful corner of the city.After meeting up with your guide outside your hotel, hop in your cycle - the city's ubiquitous pedal-powered transportation - and coast to Ho Chi Minh City's Chinatown district for up-close looks at narrow streets and charming markets that seem frozen in time since the city's earliest Chinese immigrants arrived. Learn about the traditions of this vibrant community and stop off along the way to snap memorable photos.Swing by the stalls of aromatic spice vendors and admire the ornate sculptures atop the gabled roof of the 19th-century Thien Hau Pagoda. Browse for goods among the vocal vendors of the Binh Tay Market, and wrap up your day with a delicious lunch at a locally loved restaurant before you head back to your hotel. Unravel the secrets of authentic Vietnamese cuisine on this half-day cooking tour in Ho Chi Minh City. Visit a bustling market to learn about unique local ingredients, then receive step-by-step cooking instruction from experienced restaurant chefs.Depart from your hotel and embark on a gastronomic adventure through the city. Your first stop is at a local market, where personal assistants help you choose fresh ingredients like the vegetables, herbs, and spices that you'll use for your cooking class. 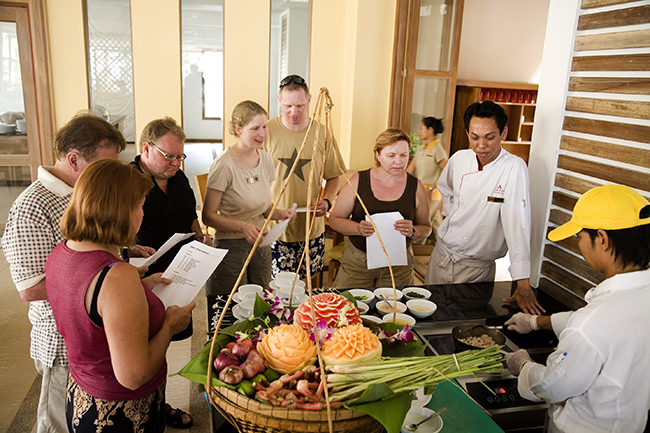 Then learn the secrets of preparing Vietnamese food with the ingredients you've chosen. Expert chefs are on hand to provide guidance and assistance throughout the cooking class.Interact with your fellow cooks to further discover handy techniques as you prepare your simple, healthy dish. After this informative cooking session, sit down and enjoy a satisfying and delicious authentic Vietnamese meal—served in addition to your culinary creation. Leaving the busy streets of Ho Chi Minh City, your driver takes you off to the coast to visit the lush Biosphere Reserve of Can Gio Mangrove Forest and Rung Sac Guerilla Base. 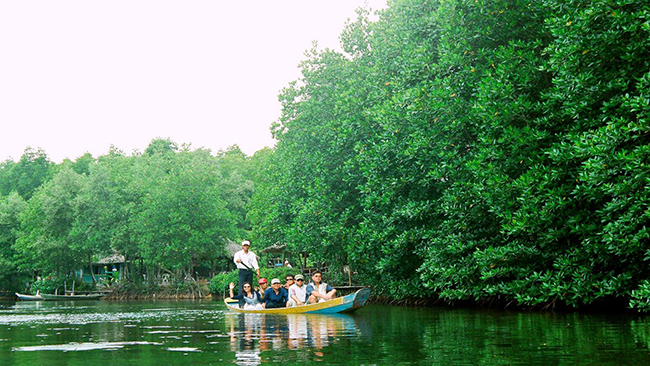 Take a boat through the crisscrossed waterway of the mangrove forest, stop for lunch, and admire the idyllic countryside.Climb on a scooter and as you leave Ho Chi Minh City with your experienced guide, watch from the back of the scooter as the scenery changes from bustling urban streets to the rural countryside with enormous rice fields, terrace houses hidden under the shade of the fruit orchards, and dirt trails. Weave through scores of boats loaded with bright piles of freshly picked produce and neatly folded stacks of new clothes. 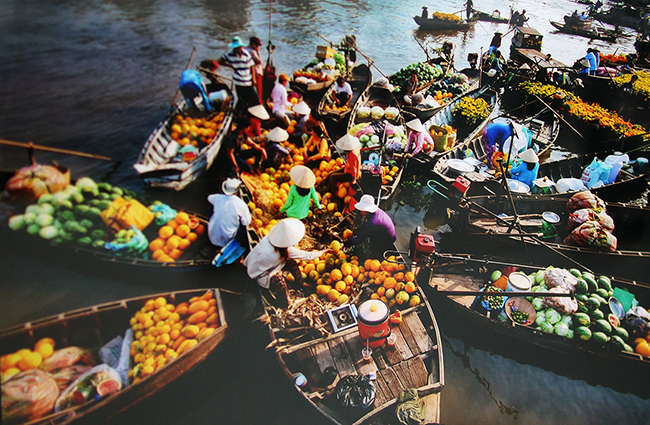 Barter with vendors for unique souvenirs and watch the interactions between locals at this fascinating floating market. With a local to lead you, explore the village of Cai Be.Join your guide outside your hotel and take a quick ride to Cai Be for a zigzagging boat trip around the village's floating market. Look for energetic vendors selling fresh fish, see families pick up their daily groceries, and do some shopping of your own at boats filled to the brim with quality handicrafts. Take a detour to locally owned workshops where you can get up-close looks at the processes behind making sticky rice paste, sweet coconut candies, and savory fish sauce. Continue your foodie exploration with a tasty lunch, served up in a serene orchard setting on An Binh Island, and then investigate smaller waterways with a leisurely rowboat ride.Catch glimpses of the rural fisherman casting their nets, pop into a garden full of fruit trees to sample some of the day's harvest, and chat with locals while sipping strong cups of rice wine before you jump back in your ride and head back to your Ho Chi Minh City hotel. 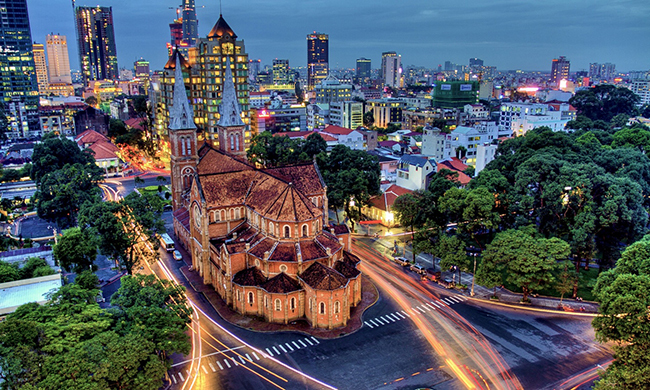 Explore Vietnamese culinary delights in the heart of downtown Saigon. 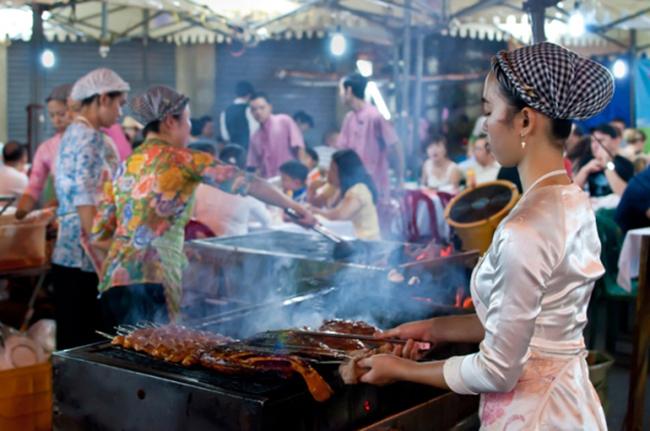 In the evening light, delve into the city's food scene as you follow your expert guide on this walking tour to discover new cuisine and treat your taste buds to some of the finest authentic foods in Vietnam.After pickup from your hotel, meet your guide and begin your evening exploration of Saigon. Snake through the small alleyways only a local could take you to, heading toward one of the city's most popular restaurants. Your guide describes the transformation the city has undergone in recent years and it's treasured past, as you try some of the weird and wonderful foods Vietnam is renowned for.Watch Saigon come alive under the cover of darkness as you tour the foodie-luring hotspots of the city. 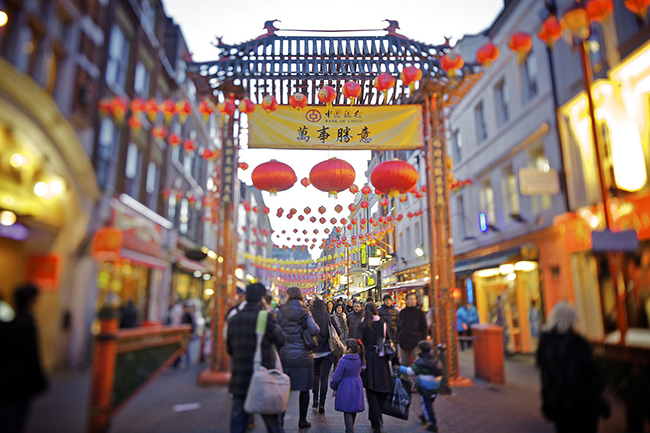 Visit locally beloved street stalls, having the opportunity to enjoy a dinner banquet including rice paper pizza, fresh snail dishes, and a Vietnamese pancake known as banh xeo. Pull up a stool and soak in the animated ambiance before your night ends on a nice note with a delicious sweet soup dessert. Explore the paddies and sugar cane fields of Vietnam's countryside with a bicycle ride along the Vam Co Tay River. 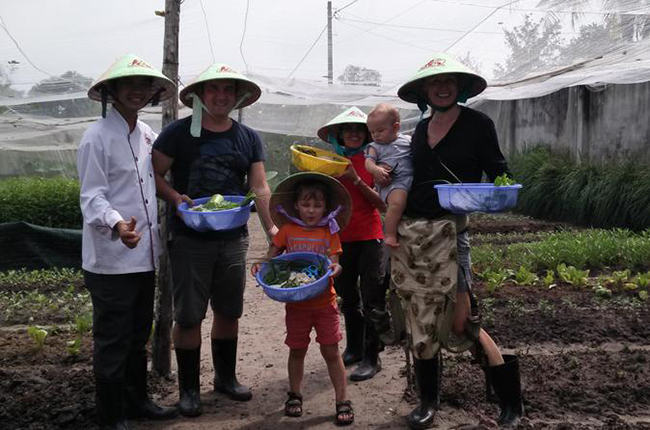 Spend 2 days in the suburbs around Ho Chi Minh City, get to know the people with a stay at a family farm, and see the country through a local's eyes.Day 1: Meet your guide in Le Minh Xuan Commune and start pedaling for the 4.3-mile (7-km) ride through peaceful villages on quiet back roads. Visit a family-run incense-making workshop and rest at a local pagoda along the way, and then take a motorboat ride to a wide lotus field, where you can try to collect one of the flowers to prepare a delicious Vietnamese salad. Return to land and keep cycling over a high bridge to visit a local primary school. A transfer takes you to a farm at Binh Tien, where your host family greets you with a homemade herbal drink. Get to know the family, watch the ducks swimming in the pond, or admire the tropical fruit trees, vegetables, and flowers in the garden before a lunch prepared from homegrown fresh ingredients. After some time to relax in the afternoon, take a ride around the village and visit some vegetable farms to buy ingredients for dinner. When you return to the farm, help your hostess prepare for dinner and learn how to cook the local dishes, and then sit down for good food and company over cups of rice wine. Soak your feet in hot herbal water before you go to bed.Day 2: Wake up early to join your hostess with the daily gardening and farming before breakfast with a cup of Vietnamese coffee. Afterward, you can go fishing before you say farewell to your hosts and head back to Ho Chi Minh City.